The Gregory Baltoro 65 and Osprey Atmos 65 are two of the best selling hiking backpacks. They both offer about 65 liters of space, ensuring that you have enough room for all of your gear. As these backpacks are the same size, you will need to compare other details to select the best backpack for your next hiking trip. It is easier to start the comparison by examining the similar features between the two, the Atmos 65 and Baltoro 65 have plenty of similarities. Both backpacks include a large access panel for quick access to the main body. You can quickly open the bag and reach your gear. Located near the access panel, you will find a zipper to open the sleeping bag compartment. Both bags have a spot for storing a sleeping bag separately from the rest of your equipment. This keeps the sleeping bag from getting dirty or wet from other gear. Both backpacks include a large front panel pocket for storing gear that you want to keep separate from the other items. For example, you may place your dirty socks inside the front panel to keep them from mixing with the rest of your equipment. You also get the standard attachment points for connecting trekking poles or ice axes. These loops have become standard features for hiking backpacks and can be used for more than just poles and axes. You could also clip other small gear that you need constant access to. The final similarity is the durability and water resistance of the two backpacks. They can both withstand rain and protect your gear from the water. 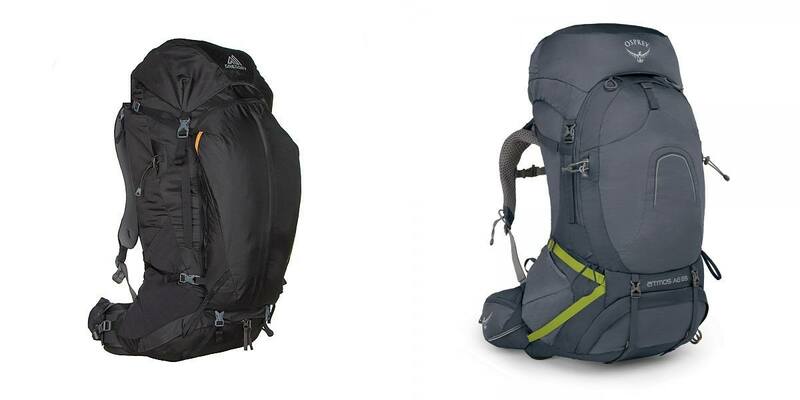 The differences between the Baltoro 65 and Atmos 65 may help you choose which of these bags is better for your needs. The first difference is the adjustability of the harnesses and hip belts. While both hip belts are fully adjustable, the Atmos 65 offers five inches of slack to accommodate a wide range of body sizes. The back panel of both backpacks is also adjustable. However, the Atmos 65 has a back panel that adjusts to the length of your torso. The Baltoro 65 includes 15 sizes for the back panel. You can easily adjust either backpack. The difference is how you perform these adjustments.Both backpacks also have removable sections. The Atmos 65 has a removable top lid. Once removed, the lid does not serve any function other than to reduce the weight and size of the backpack. After removing the top lid, you can flip the flap jacket over the top of the compartment. This reduces the size of the backpack, which may be useful for a shorter trip. The Baltoro 65 also has a removable section. However, this section doubles as a daypack. A daypack is a small pack that you can use to carry a limited number of items when you do not need all the space provided by the main backpack. For example, if you need to make an excursion to purchase food from a store, but do not need to take all your gear, you may find the daypack helpful. Both the Baltoro 65 and Atmos 65 are available in three sizes. You can choose small, medium, or large. The medium size of the Baltoro and Atmos have a volume capacity of 65 liters. The small sizes provide 61 and 62 liters of capacity, while the larger sizes provide 68 and 69 liters.The sizes are very similar, for the small and large. The weight of the bags is also similar. The biggest difference is with the medium sizes. The Baltoro 65 weighs just over five pounds, while the Atmos 65 weighs four and a half pounds. Either of these two backpacks would be great for your next hiking trip. They have many of the same features, both options are very durable, and they have plenty of pockets and attachments points. They are also very adjustable and easy to fit your body. The only major difference is the inclusion of the daypack with the Baltoro 65. If you anticipate the need for a small daypack, this could be the decision maker.